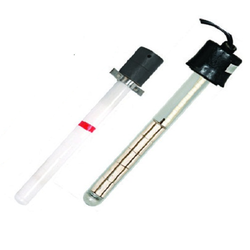 Our range of products include silica glass heaters. Our company is widely appreciated in the field of manufacture, supply, trade, service provider, import and export of Silica Glass Heaters. Manufactured at par with the set industry standards and parameters, these heaters have heat resistance rubber cap and connecting cable. These are suitable for heat water, oil etc. and highly demanded for their high efficiency. Last but not the least, these heaters are offered at economical rates to our valuable clients.